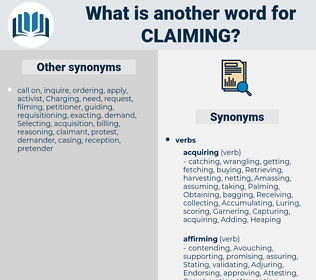 What is another word for Claiming? Interrogatories, nominations, urges, invites, Claimed. 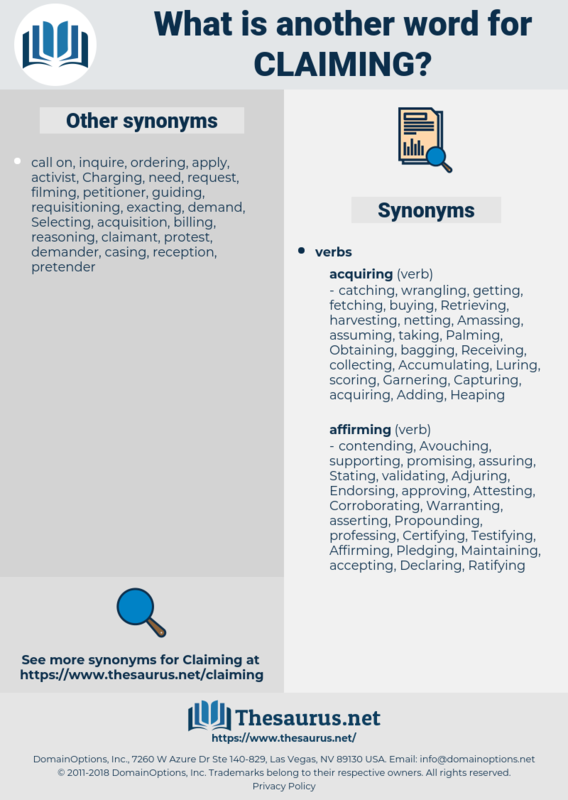 Aiming, complaining, Alleging, Acknowledging, confirming, Vindicating, affirmed, Affirming, Indicating, contending, Declaring, demonstrating, Estimating, Reiterating, declaration, Suggesting, reaffirming, Petitioning, Maintaining, Implying, calling, Testifying, assuming, Advocating, Describing, Contemplating, Reimbursing, insisting, believing, Explaining, appealing, emphasizing, Illustrating, qualifying, summarizing, accusing, commissioning, acquiring, Ascertaining, Citing, calculating, recognising, said, saying, Blaming, Recognizing, eligibility, Guaranteeing, backstopping, challenging, Availing, Designating, Obtaining, communicating, recovering, exercising, collecting, underscoring, Submitting, submits, Displaying, concluding, showcasing, Expecting, Inflicting, competing, Containing, Ceasing, prevailing, Realizing, Invoking, Attesting, Eliciting, Soliciting, accessing, Receiving, highlighting, identifying, Instructing, Proving, Sustaining, incurring, report, reporting, transmitting, costing, costs, signaling, Signalling, pleading, Prosecuting, Furthering, depicting, Specifying, Commenting, Deducting, Constituting, gathering, endeavouring, screaming, aspiring, defending, Decrying, telling, Proposing, representing, Generating, Retrieving, computing, underlining, Inferring, Considering, Outlining, directing, Recommending, Announcing, Charging, benefiting, Initiating, determining, informing, outweighing, Pertaining, pretending, detailing, Advising, becoming, upholding, condemning, feeling, Owning, mandating, failing, Pledging, emerging, denounce, Denouncing, Committing, underlying, Enforcing, Attempting, seeking, spearheading, Gaining, damaging, professing, Securing, Entailing, Intending, encouraging, enabling, moving, leaving, Purporting, killing, holding, yielding, Inciting, pointing, reflecting, imposing, advancing, listing, approving, assuring, viewing, Presenting, Placing, agreeing, walking, Addressing, Discussing, arguing, salvaging, striving, Promoting, accounting, questioning, Repaying, performing, Endorsing, wishing, marking, Expressing, Exhibiting, toppling, Adding, Allowing, succeeding, Providing, Relying, affecting, Granting, approaching, triggering, concerning, Creating, paying, according, refunding, helping, contact, causing, falling, prompting, crying, Wreaking, ruling, sponsoring, showing, finding, deciding, provoking, inviting, beheading, unleashing, honouring, Referring, losing, backing, owing, awarding, undertaking, favoring, observing, yelling, Carrying, reasoning, Noting, Assisting, stressing, drafting, stirring, support, supporting, wondering, Underpinning, singing, Treating, deafening, Exposing, pursuing, Producing, Defeating, blocking, selling, Querying, growing, rendering, Adopting, shouting, leading, bearing, ensuring, wanting, Respecting, severing, branding, turning, drawing, breaking, driving, featuring, being, Objecting, enter, setting, resulting, acting, figuring, dealing, giving, Forcing, Stating, netting, Forming, Needing, bringing, raising, touching, reviewing, shooting, fostering, Begging, looking, using, stoking, sending, judging, going, putting, Having, sensing, taking, posing, trying, Dunning, making, name, names, cutting, getting, Doing. Proving that the Syllogism is useless for a certain purpose, and then claiming to have proved that it is useless for any purpose is another example. Representations of injuries resulting to several persons claiming to be citizens of the United States by reason of such violations were made to the Spanish Government.